This month we head to a very unique part of the Caribbean, Guyana. It is unique in the fact that it is not an island, but a sovereign state situated on the northern coast of South America. Historically known as the ‘Land of Many Waters’, its heritage can be found flowing through the veins of many notable people, including Baroness Valerie Amos, Lord Herman Ouseley, the late Bernie Grant MP, David Lammy MP, Trevor Philips and pioneering US activist Shirley Chisholm. Many artists and entertainers have roots in Guyana, such as the distinguished playwright, poet and author John Agard; British-based actors Norman Beaton, Carmen Munroe, Ram John Holder and Cy Grant; and musicians such as Phil Lynott,, global superstar Rihanna and Eddy Grant, the platinum-selling musician and entrepreneur. 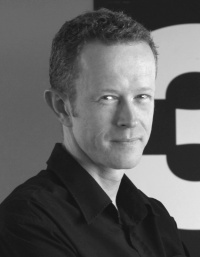 It was Eddy who first mentioned the name of this month’s profiled creative to me, speaking with pride and reverence about the work of his fellow countryman. And who similarly I am proud to bring to your attention now. 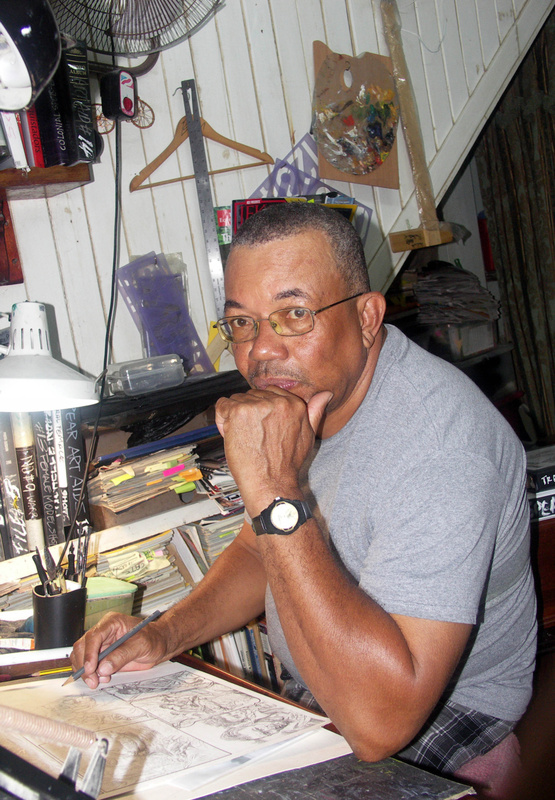 Introducing the graphic artist and illustrator, Barrington Braithwaite. I’m from roots that have produced folk in the arts and media. It’s kind of infra dig though, to talk about folks when the discourse is about self. I spent the formative years of my life with my godparents at Mahaica, rural Guyana, after my Adam and Eve went separate ways. There I was given the opportunity as an only child in their care to explore my imagination. My godparents encouraged my interests and only after their deaths did I realise that I had a privileged initiation to life – I actually have five sisters and four brothers. I was lucky that the Forbes Burnham post-independence Government of the 70s was developing youth-training organisations and bringing experts from overseas in different fields to train the youth of that period. I was interested in art or, I should say, I was compelled by this passion. However I became part of a young settlers co-op group after school in 1974 and there did courses in co-op management and field practices. The Cold War temperature was impacting on Guyana, I left the co-op and worked on the waterfront to survive, until I was encouraged in around 1981 by my friend ‘Fat Boy’ Herbert Archer, a poet, to take my portfolio – which wasn’t much – to Dr Denis Williams at the Walter Roth Museum of Anthropology to negotiate a way out of the dog-eat-dog waterfront world. 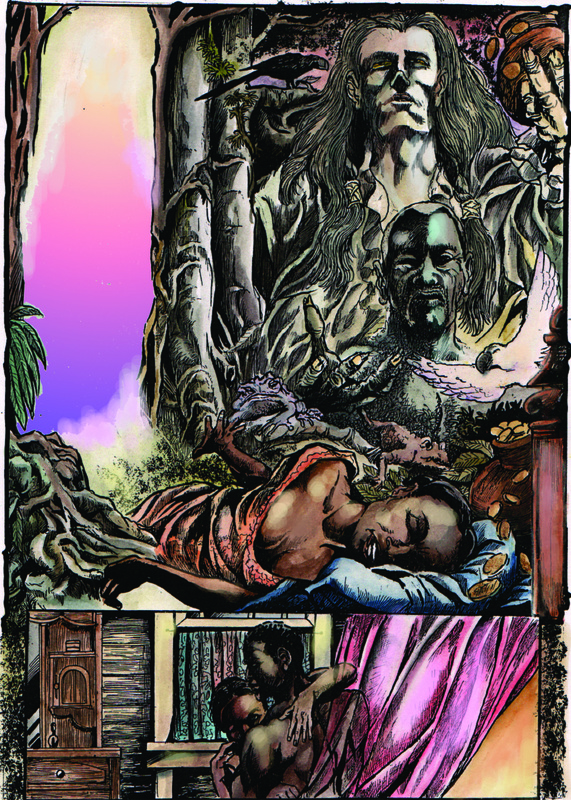 He engaged me and placed me through the training of a scientific illustrator, but I couldn’t help who I was and while on one particular archaeological site in the Northwest of Guyana’s Rain Forests, I wrote my first two stories to be illustrated. I was supposed to go to Scotland to complete my training but it was decided that if I went I wouldn’t return, so disgruntled I left the museum, and worked freelance as a commercial artist at the Guyana Chronicle. With the support of editors I developed and published several comic strips and serials. With a young family I started an advertising service to keep the pot boiling, and have maintained that while developing and self publishing my graphic magazines. As far back as I could remember I was enthralled by comic books and most of all telling stories using that medium. While in school I became the class artist. This fame extended even to higher forms, from helping with class art assignments to doing rip-offs of commando comic books in four-page exercise-book middle-page pull outs. These were sold for a penny. I had to wait until 1981, when I was employed by Denis Williams. I presented him with an illustrated story I had done named The Shrouded Legacy. 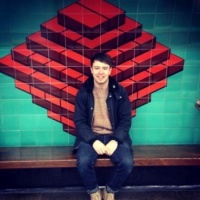 He took me and my story down to the national newspapers who I think he bullied to accept it, and I was guided through my first contract and received my first cheque. When it hit the Sunday pages I received in the weeks that followed great harassment from friends who then pointed out my errors which were many. I had used the only drawing pen I had, didn’t understand the concept of lettering or word balloons and was not a good artist qualified for publishing by the standards of the day. Eerie, Creepy and the Warren Publishing line had enveloped our horizons. I prayed for my series to finish and the torment to stop. I did not fold up and it took years with my wife as the female model and some old muscle magazines for the males to develop my skill, this was a weird mix and with the critical help of my buddy Andy Anderson I emerged with the Elder comic strip, that through negotiations the newspapers carried. As I said before, the policy of the Government back then was to encourage the local arts, but there were standards to be met. I had decided by 1983 to develop a medium for the talents that were directing my thoughts. I had no idea at the time of the necessary independent support systems that were needed to make this happen, I concentrated on making my artwork meet the acceptable standards. In 1988 I published the trilogy of The Shadow of the Jaguar. 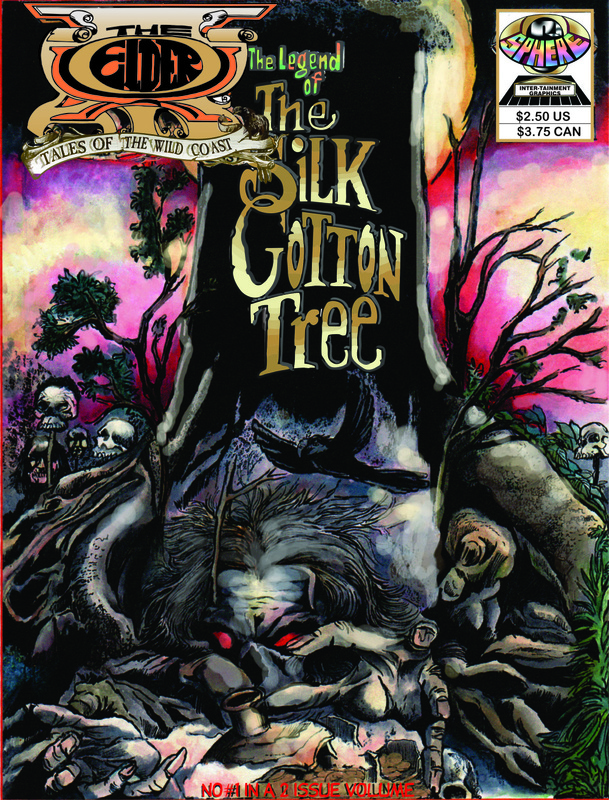 In the ‘90s I wrote and illustrated The Legend of the Silk Cotton Tree – this went from graphic magazine to stage play in 2010. I work under the Company Name Spectrum Creative Productions and administrate a small advertising service, and have done work for UNICEF, the West Indian Cricket Board and other agencies. The goal of a pure graphic magazine publishing outfit continues to propel the production of several new projects that are yet to be published. 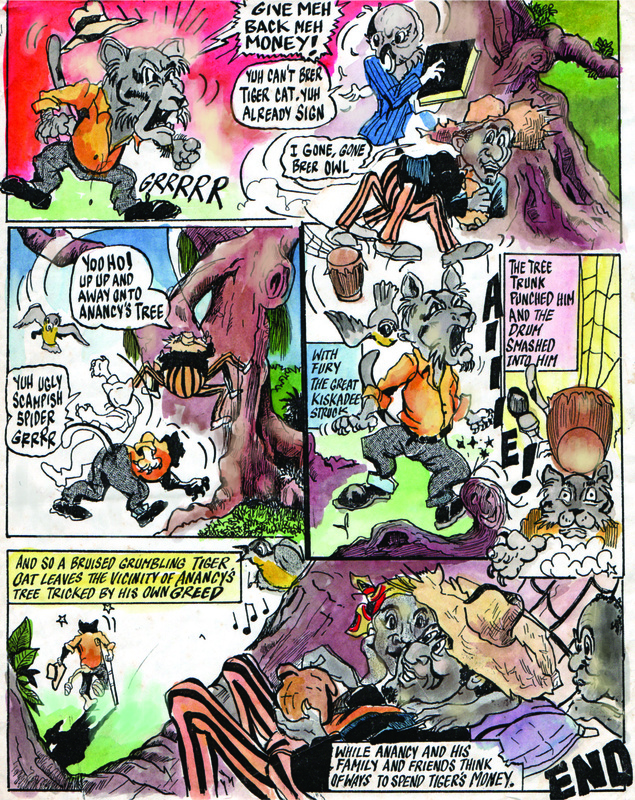 There is no publishing industry in the CARICOM belt and the comic book industry is even further away from this reality. The most unexpected and vicious opposition to my work as a self-publisher did not come from competition, but from those who had appointed themselves the custodians of proper culture in Guyana. These were characters that were more British than the English who had ruled British Guiana. The idea of an Afro Guyanese hero was offensive I think to both the caricature class and the PPP government. The Shadow of the Jaguar strip in the National Chronicle Newspaper was dropped after the PPP Government was elected in 1992. 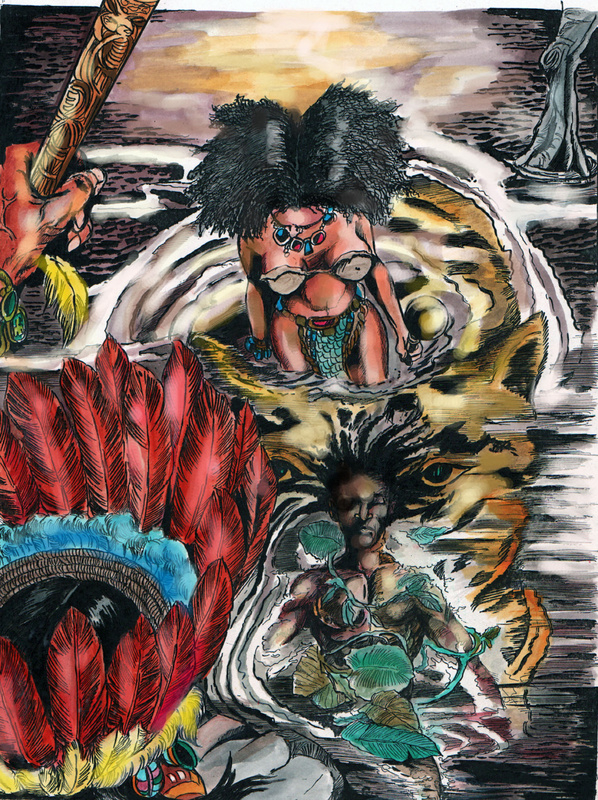 I had long concluded that Guyana was not the world and since I had always trained my art along the guidelines of a holistic illustrator’s universe, I proceeded now as artist activist resident in my country. The challenges also lay in understanding the rules of protecting one’s work on the international market place, and having a working understanding of contract law. With the rise of new technologies to apply that to production, also charting a network for collaborations wherever the veins progressively lead. Venture capital has always been the unpredictable Cerberus, from a working-class hemisphere talent as me. Cultivating and honing one’s talents and creative skills were the first of the labours, next lay the support forces, space for work, raising a family and no external finances, rising above this is a task of pure will. Only the perseverance, the muse that from its inception was the driving force, delivers the irrational incentive to face these factors towards the realisation of the real fulfillment that is having the complete means present to publish as I see fit the full studio of works that encompasses the last 35 years. I was enthralled by the Sunday cartoons and comic books and I had inherited artistic and the scribe’s talent. Then my greatest influences came from the debates in my father’s workshop about local legends, aspects of Caribbean history, Biblical accuracy against movie stuff and other subjects that preoccupied my serious conversations into early manhood. Some of these subjects required research, like when I thought [at about ten years old] that the Ten Commandmentsmovie reflected things that had happened in Spain – it isn’t funny bro. Reading brought me new ideas and information and in discussion with my peers they rebuked me that I should do comic strips about our topics – a herculean task, but an inspiration. Realising that my talents can fill a vacuum with edutainment tales and characters was the greatest inspiration that propelled me into this career. I would like to think that I’m currently working on my most valued project. I first attempted the current project, which in its concept presents WWII and then links it to other historical epochs in a mystical way, because this project has some moons to go – I can’t get into the details. What I can say was that I started it around 1984 and I had shown Dr Williams the first concept issue. He proposed to purchase it for the Department of Culture’s Library, I was been trained as a scientific illustrator and was finding it difficult to survive on the Government’s stipend. He then asked me where I was taking the story, what were the elements I wanted to explore? I explained to him what I wanted to do, what had gripped my imagination. He shook his head and explained to me that I should give the ideas about 20 years to grow because I didn’t have the information at the time, he asked me some questions, to which I replied, he then answered them for me to illustrate his point then assured me not to bother with Hollywood and to cover both African and European history deciphering the in-between propaganda that is inserted in historical works, by cross reading. Reading that included the metaphors of the mystery systems, and Dr Williams concluded prophetically, that I’ll know when I’m qualified to address the topic. Yes I was pissed, but convinced by his questions and his counter-answers that I didn’t know as much as I thought, to do this work of fiction. I was mentally oriented that I must be conditioned to face the exploration, and exploitation of ideas with an understanding of the subject, whether it’s the geography, architecture or costumes. With the medium of graphics one has to come close to accurate. The origins of conflicts cannot be taking for granted either. For example – the current Ukrainian issue, where did it start, was it in the Middle ages, the Stalinist era, or with the Nazi era? A framework for a fictional work has to be grounded in a mythic or historic reference sphere , from there, the poetic license can be applied. So that attitude towards work compels research for development and if you’re operating outside of a major budget , then the work is on you and it will take time, lots of time. Dr Williams was right; I couldn’t do honest work on the subject matter of the graphic series now in progress without a wealth of historic time travels, and a working knowledge of religious beliefs across migrations into their modern innuendos. Because it’s not yet protected I can’t provide insights, except to say it’s my pet project. 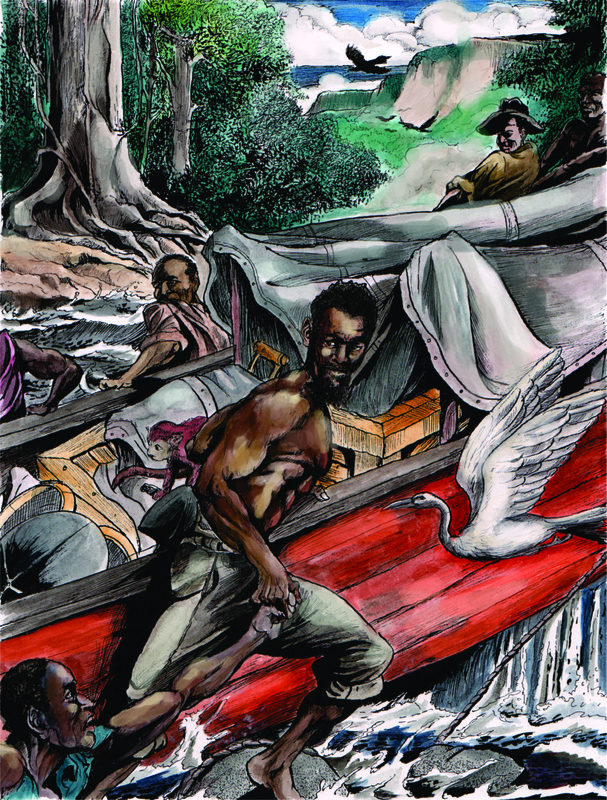 I’ve just finished a recent pet project that I’ve been working on for years, a graphic novel on the Haitian Revolution, a whopping 123 pages, hand coloured and compartmented into five sections. From the period of composing the first page, outside of the years of research, it took three years to complete and now it’s the stuff of nerves to work out the deal that will take it to pay-day. This can be considered my current showpiece, because it was never done before. But as time goes the showpiece changes with the season. The greatest achievement as a job for me is to be able to work on set designs and costumes for one of my graphic works turn into a movie, then with enough money I’ll finance research into a lens that can peer into the stuff dogs howl at. Who in your field that you believe deserve credit or recognition? That list would begin with my parents, whose genetics gave me a certain persuasion, then my muse, who’s out there and whispers and guides in some uncanny, save the moment coincidences, I’m still searching the science magazines on the data of the human brain to see if they’re any clarifications that suit my muse experiences – none so far. Mr Hunter, the head master of the school I attended on the rural east coast of Demerara in my formative years, was a tremendous influence. My godparents Abel Burke and Elizabeth Cumberbatch, who raised me in my formative years until their demise when I was about 14 years old, had indulged my curiosities for toy soldiers, comic books and had engaged me in conversations about the travels of Odysseus and Aesop’s tales, they can be credited with shaping the foundations of my later creative career development. My buddy Andy Anderson, who was my personal critic on the evolution of my art, the long after-school debates on technique in the Art room of Queens College. My Mother Grace lived outside of Guyana, my father was the resident parent, and Hubert Braithwaite never stood in the way of my boyhood interests, though he guided me towards the illustrated Classics and coerced me to read my first novel which was the Louis L’amour book ‘To Tame a Land ‘, my dad read lots of western novels,. he did subtly guide me towards Architecture and furniture design, he built houses and had a furniture making operation, which I found exciting but was mundane in respect to the creative stuff that was compelling me. My wife Donna and children Michelle, Taharka and Makeda who were all seconded for model services over the years, and as the photographer when I had to be the model for immediate anatomy fixes. They endured my on-the-job hastily applied lessons on the model or photography specifics, they snarled and scratched and I growled, until we got it done. When I started in the media, at the Chronicle there were people there who were interested in the unveiling of local graphic storylines, and there are names I must include: Claudette Earle the Sunday editor, Godfrey Wray another editor, Adam Harris, Frank Pilgrim and Ulric Captain, all managers at Chronicle, the latter who I was working with to expand to the Caribbean to have a general pull out graphic publication When the Government changed. My pal Poloma, now Professor Poloma Mohammed, a playwright and writer herself who was always there, and David Granger [Brig. Rtr] whose publications on local history gave me the opportunity to interpret much of our local history in graphics. These are the pivotal persons who have come to thought in related fields. And finally the late Poet ‘Fat Archer’, and the small businesses with an interest in the arts who always supported my graphic projects. I would hope that certain systems are in place with the activism of myself and others to make the acceptance of the local graphic storyteller friendlier and with a greater respect for the value of the work produced. The road of the illustrator, painter, poet and writer is not an easy one, the more talented the artist is, will mean the more challenges, and with originality must come the strength to defend the new explored territory. Young aspirants to the graphic arts must understand that they’re embarking into a serious field, especially if they are going to write their own creative or documentary projects. They must, apart from honing their talents, mastering the areas of anatomy, materials and technique, have a historic understanding of the evolution of the field, from the caves to the current top guns, whose work continue to inspire and move us onto our own. 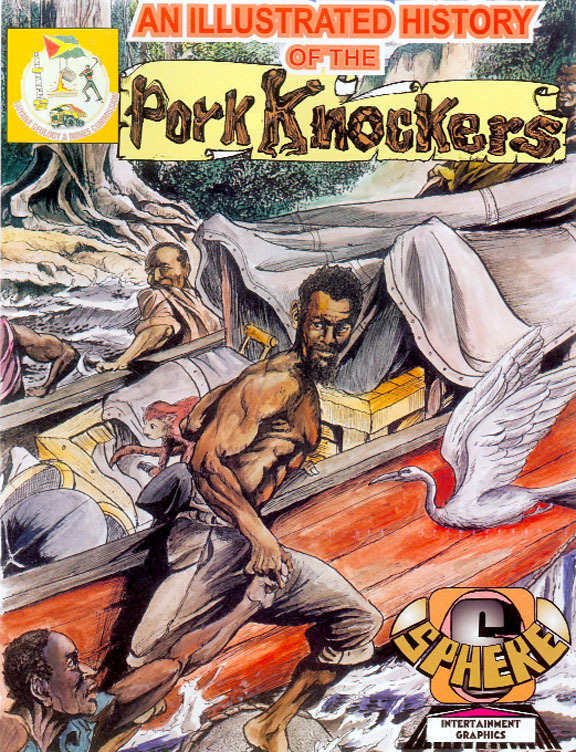 For me it was the unknown artists who did the Commando comics, then on the local Guyana scene it was Rudy Seymour who did the first local comics I knew. I later engaged the work of Tom Feelings. Frank Frazzeta , Bernie Wrightson, Will Eisner all came after I had the gift of Treasure Island illustrated by Newell Wyeth. Old magazines led me to the French and Europe, Eugene Delacroix, Dore’ and the guy who in my view jump-started the modern fantasy art trend: William Blake. But this reservoir of knowhows about the field wouldn’t be enough. The practicing artist has to understand the legal world of copyright, to protect from being sued for violating the commanding piece of art or photography you adopted verbatim into your stuff, or if the situation is vice versa, then copyright becomes your best friend. This wouldn’t be complete without a working understanding of contract law. Contract law is a significant crossroad process that will build or break you – from experience I can tell you this. Your talents can work for you or for some other wiseguy, based on what you know when you leave the environs of your muse and enter the entangling vines of the rainforests out there. The next limb on the tree of life I’m reaching for is for the fruit that enables me to launch internationally the pivotal four graphic series I want to place on the market, this would entail the cash-flow to recruit back-up talents and publish the first two unhindered, then the other two series mentioned. This would open the door to introduce, based on the response of license relationships solicited or attracted explorations into comparative mediums, that would allow realising the exploration of other latent ideas for different audiences. Without further whimsical elaborations, the above capture what lies ahead. A very special thanks to Patrice Hinds for his help in facilitating this interview. Japanese Poster Art Cherry Blossom & Asceticism. Intended as a cultural contribution to the 150th anniversary of the establishment of diplomatic relations between Japan and Switzerland, the exhibition presents the history of the poster in Japan, where this medium is primarily known as an artistic statement and image advertising. Works by three old masters, Shigeo Fukuda, Kazumasa Nagai and Ikko Tanaka – from a generous donation to the museum – are to be seen alongside posters from 1950 to the present day. Here the special aesthetic of Japanese graphic designs reflects the dialogue between Eastern and Western visual culture. Runs until 25 May 2014 at Museum für Gestaltung Zürich. 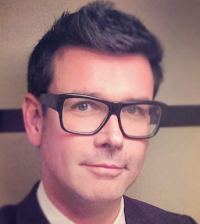 If you have any forthcoming events that you would like to be considered for inclusion in this column, please do not hesitate to contact me by email at info@jon-daniel.com. 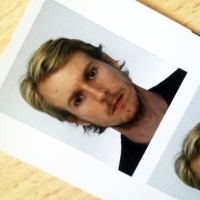 Jon Daniel is a London-based Independent Creative Director, Designer and Curator. For more information visit his website at www.jon-daniel.com or his blog at www.visual-intellectual.com. What do you think is the best-designed coin, and why? What is the largest thing you have ever designed?